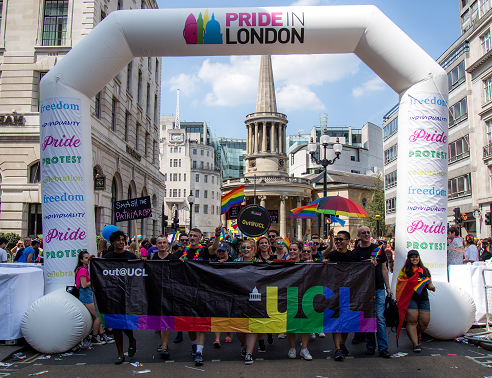 On Saturday 7 July, members of Out@UCL - UCL's Lesbian, Gay, Bisexual, Transgender, Queer +* (LGBTQ+) staff network - participated in London's annual Pride march to promote LGBTQ+ equality. An estimated 30,000 people gathered in Central London to celebrate the LGBTQ+ community and promote equality for its members. The annual parade is a key event in the LGBTQ+ calendar providing a platform to raise awareness of issues faced by LGBTQ+ people. The Out@UCL walking group was the biggest and most diverse in its history, with 60 members of staff, friends, partners and children - representing a wide range of races, ethnicities, ages, bodies and faiths. An after-party was held that same evening in Malet Place, hosted by LUKI - a collaborative between the LGBT staff networks of LSE, UCL, Kings and Imperial universities. On Sunday 8th July, the following day, a small group of Out@UCL members attended UK Black Pride in Vauxhall Pleasure Gardens, a festival celebrating Africa, Asian, Caribbean, Middle Eastern and Latin American culture. Anne Moore and Sandy Kutty, Co-Chairs of Out@UCL said in a joint statement, "Once again, the energy and passion the members of Out@UCL, Friends of Out@UCL (UCL's LGBTQ+ allies staff network) and other friends and family brought to the day was incredible. "To see such a demonstration of team spirit from across the UCL community, including academics, professional services staff, members of UCL's Senior Management Team and students is testament to the level of support UCL's LGBTQ+ community receive on campus and we are delighted with such a visible display within the streets of central London - a hugely powerful statement of inclusivity to current and future UCL students, staff and visitors! "We were especially pleased to have a presence at UK Black Pride for the first time, albeit a small one. It's particularly important that LGBTQ+ people feel comfortable to explore all aspects of their identities, including race and religion. Black and Minority Ethnic (BME) members of the LGBTQ+ community disproportionally experience homophobia and transphobia within their communities, often due to religious or cultural beliefs, as well as racism within the LGBT community itself. UK Black Pride offers a space for BME LGBTQ+ people to be at ease and to celebrate their gender, sexuality and ethnicity. "Between 20th and 22nd July, we are delighted to be flying the Transgender Pride flag for the first time from the UCL Portico. Coinciding with the Trans Pride festival in Brighton on the same weekend, the flag will serve as a statement of solidarity from UCL with the wider trans and gender non-conforming community. We look forward to raising it once again during Transgender Awareness Week from 13 - 17 November. "We thank the entire UCL community for their support over the past year and we wish all a peaceful and enjoyable Pride Month." For more information on Out@UCL or FriendsofOut@UCL, please visit the UCL HR website or follow Out@UCL on Twitter. *a '+' is added to the LGBTQ+ abbreviation to ensure we are inclusive of all minority sexual or gender identities who do not identify as either lesbian, gay, bisexual, transgender or queer.